How many times have I lain awake wishing for my heart to rest? If there was a switch for my brain I would shut if off. Breathing in peace only comes when I breathe in prayer. Many times I have prayed in the darkness of my bedroom at night, begging God for the peace to sleep. What yoke do you carry? I’ll admit and be honest with you friend: worry is a yoke I wear most nights before bed. The yoke of worry was never mine to wear. 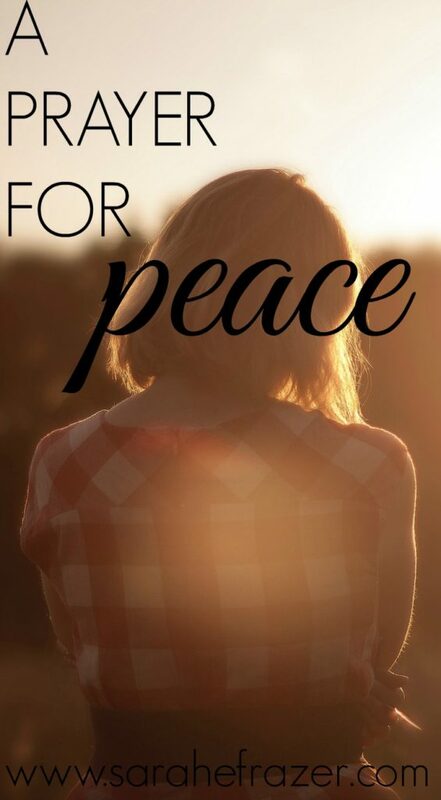 Isaiah 26:3 says: “Thou wilt keep him in perfect peace, whose mind is stayed on thee: because he trusteth in thee.” When God swallows up death forever (Isaiah 25:8), we will have perfect peace. That is our promise. Do not let worry keep you in locked up in prison! The promise is the peace, and we need only reach into our hearts and claim it. To help, I hope this prayer below will give you enough hope for one more day. O God of goodness; the Father who holds His children close, will you meet me here? Right now I’m struggling with a season o discontentment, anxiety, and rush. Let me find rest in your peace today. I praise you for your goodness, even in the anxiety. You are good. You are a God who promises me peace, so I come with courage and confidence to your throne, petitioning the Almighty to bring peace, breathe it into my very soul. Let me rest in your arms as I stay busy and do the good work you have called me to do. O God give me productivity and peace. I will keep my mind stayed on you as you keep me in perfect peace. Amen.